One of the big trends in fast food for 2015 will apparently be customized burgers. McDonald's (MCD) and Wendy's (WEN) have been talking up the ability to give customers more choices with custom-tailored sandwiches as a way to drum up sales, living up to the "Have it your way" mantra of rival Burger King (BKW). No one is taking this as seriously as McDonald's. Sure, customers have always been able to dress up their sandwiches as they see fit. You don't want pickles on your Big Mac? You want some extra ketchup on your Quarter Pounder? No problem, the customer is always right. However, now the world's largest burger-flipper will be leaning on technology and a gamut of new ingredients to give customers a wide array of tastebud-tickling choices in the year ahead. McDonald's began to test the "Create Your Taste" platform earlier this year, in which customers peck out orders for their dream burgers on tablets. Most burgers have just a handful of ingredients to play with, but the tablet-based platform lets hungry patrons assemble their sandwiches from a list of roughly two dozen toppings. We're talking about both obvious and not-so-obvious options, including caramelized onions, tortilla strips, garlic aioli and guacamole. The test is apparently going so well that 2,000 restaurants will be offering "Create Your Taste" in 2015. McDonald's is not alone. Wendy's also began testing customized burgers this summer. It's not taking a high-tech approach to the process, though. There are no colorful tablets for beef enthusiasts to build up their meals. The Wendy's test lets customers choose the type of bun before proceeding through an array of sauces and toppings that include a half-dozen cheese options alone. This is clearly the fast-food industry's response to the gourmet burgers that are gaining in popularity as fast-casual concepts. 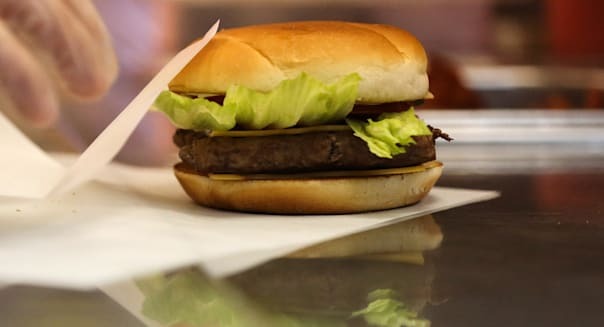 McDonald's and Wendy's are hoping that giving patrons a more customized burger will improve perceptions of food quality. That's a pretty big deal, particularly at McDonald's, which ranked dead last when it comes to burger quality in a Consumer Reports poll earlier this year. However, this won't necessarily be a slam dunk for the country's largest burger chains. If anything, it's a move that may be running counter to what McDonald's is telling investors it's trying to achieve. Comparable-restaurant sales have posted year-over-year declines at McDonald's for 12 of the past 13 months. McDonald's thinks it has a handle on the problem, and earlier this month it stated that "simplifying [its] menu" is one of three goals to turn its fortunes around. This isn't a new rallying cry. McDonald's has talked up menu simplification for three months in a row. And it's not just lip service: It has revealed that it will eliminate eight menu items next month as it tries to dumb down its offerings. It's just not letting folks know what those eight departing items will be. This makes the "Create Your Taste" move so perplexing. McDonald's feels that customers are staying away because the complicated menu is making drive-through lanes go slower and more patrons are coming back to the counter with orders that weren't prepared correctly. Won't offering up two dozen possible ingredients make the prep times and botched orders increase? Is Wendy's sure that it wants to follow McDonald's into offering up a wider wheel of flavor options? Unlike McDonald's, at least Wendy's posted positive comps at company-owned locations for its latest quarter. McDonald's is shaping up to be a walking contradiction next year, and whether we call it complicated simplicity or simplified complexity, it probably won't be shareholders that get to have it their way in 2015. Motley Fool contributor Rick Munarriz has no position in any stocks mentioned. The Motley Fool recommends McDonald's. Try any of our Foolish newsletter services free for 30 days. For a list of high-yielding dividend stocks to complement your portfolio, check outour free report.